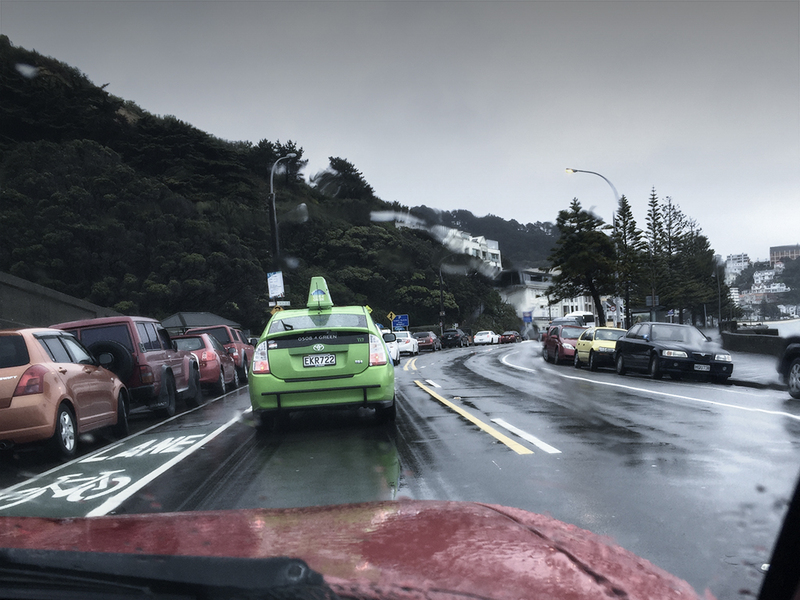 After 3 weeks of rest and relaxation we’re back home in Wellington and back into our routine – including the daily commute to work. And despite it being spring we were met with a pretty good impersonation of winter. Sigh. Wellington has been experiencing a drought. It has been a dry summer and with no rain in the last 6 weeks all outdoor garden watering was banned a few days ago. By Sunday we were down to 20 days of water left in the reservoirs around the city. Presumably once that’s gone we will be forced to drink wine and bathe in champagne. And friends, any spare bottles of Perrier you have sitting in the cupboards, please send it this way urgently. If you sense a little cynicism in this post it is only because I am a Wellingtonian and I just knew that the good weather couldn’t hold out forever. Yesterday and today the rains arrived. Good news for the garden but bad news for the Wellington water supply – apparently. Because the catchment area streams and rivers have been so low and full of dust and dirt, the recent rain washed all this muck with it and became too dirty to be purified by the Wellington water system. So the irony is that after 2 days of solid rain we have 2 less days of water available. Now, where’s that champagne? The locals in Positano have always said that the weather in November would be fine but in December it would rain. And on cue, yesterday it rained for the first time in just under a month. And as with most things in Positano when it rains, it rains properly. With no real storm water drains the water soon turned the streets and steps into mini streams. On the plus side the temperature was still in the mid teens and the complete absence of wind meant umbrellas were ideal protection. Sadly we’d left ours at the villa so it was a soggy paddle around the village to do our weekly shopping. But by mid afternoon the skies had started to clear and Positano provided a new variation on it’s usual sunset, just as a way to make up for the rain. 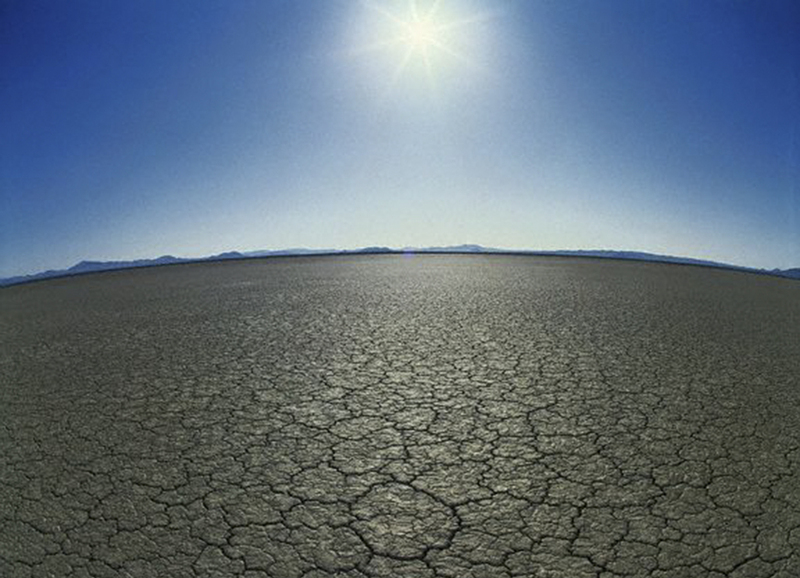 The weather forecast for today was a 70% chance of rain. And for the first time since June the grey clouds gathered and the heavens opened. 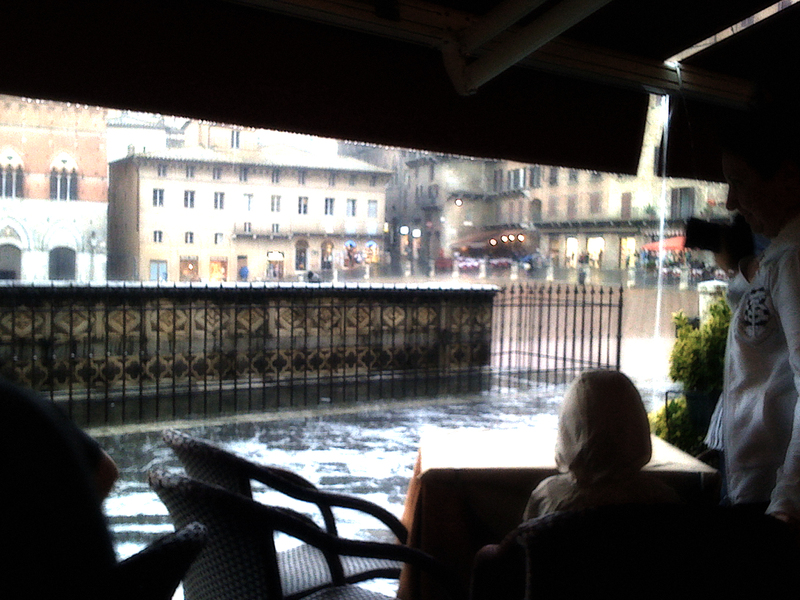 In the distance Siena disappeared as the rain enveloped it, only to reappear a few minutes later. Around us the rain fell straight to earth as there was no wind (a novelty for those from Wellington) and you could hear every drop strike the parched ground. Yesterday we had our third language lesson in Siena. The day started out sunny but with thunderstorms rumbling around the hills in the distance. By 4pm our lesson had finished and we adjourned to a bar in the Campo for a well earned drink or two. The thunder was closer and the sun had been replaced by clouds although the temperature remained in the low 20s. Clearly the locals expected unsettled weather as the awnings and umbrellas that protect the bars and restaurants around the Campo from the sun had been kept in place. Rain falling in the Campo. At 5pm the heavens opened and the rain came down. Big, fat drops and unusually for someone from Wellington who expects rain to fall horizontally, they came straight down. The crowded Campo emptied immediately as tourists rushed for shelter, some in shops but the majority straight to the nearest bar – all forced to buy drinks they didn’t really want at Campo prices. The Sinese locals produced umbrellas and continued going about their business as if nothing had happened. 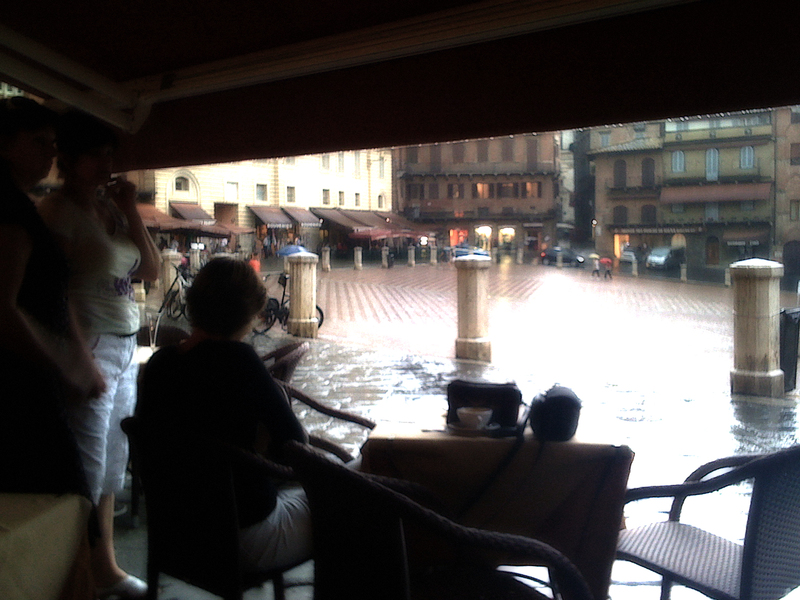 After 10 minutes the rain eased, the skies lightened and tourists flooded back into the Campo. All about €10 poorer for their drink. We took this opportunity to make our way back to the Peugeot congratulating ourselves on our timing. Not so fast, about halfway to the car the rain started again and, like everyone else we headed for the nearest shelter. In our case it was a bag shop in one of Siena’s small side streets. 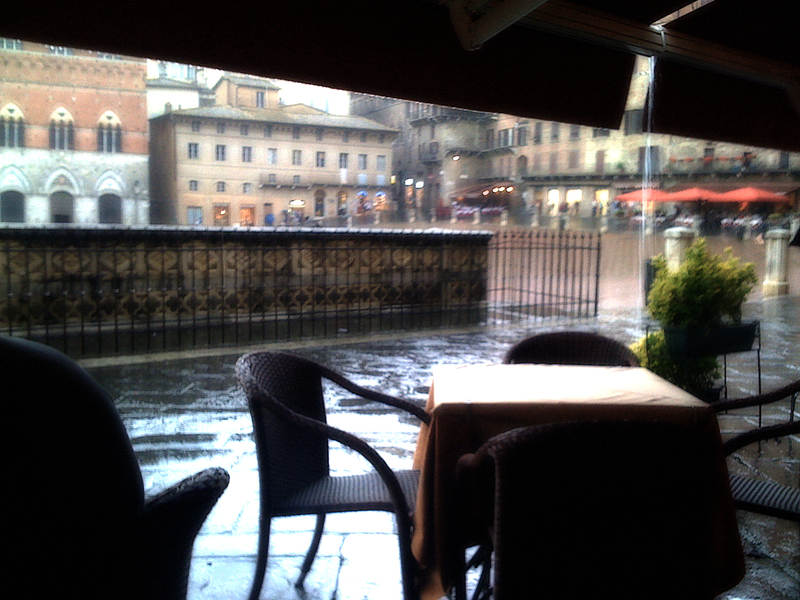 But for the period of the rain it sold umbrellas – as did every other shop in Siena. Bins of brightly colored umbrellas had appeared from nowhere and were prominently displayed just inside the shop doors. We took two – €16, Grazie. 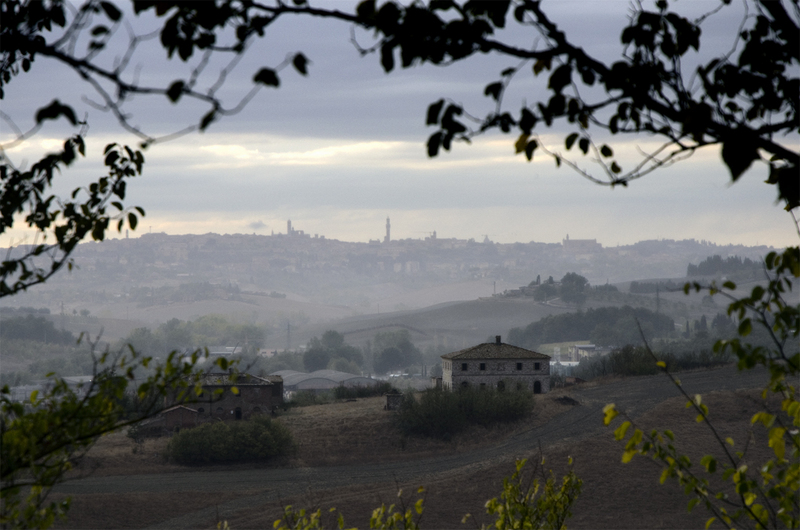 However Siena is described it is, above all, a city of merchant traders. Please note: photographs used have been digitally enhanced to highlight moody weather.